Background: Despite widespread knowledge of the health consequences, tobacco use, especially smoking is common globally. Most of the youngsters become smokers annually and one-third of them are believed to die due to tobacco use. Aim: To assess the various reasons for smoking among teenagers of age 14–17 years. Materials and Methods: A descriptive cross-sectional survey was conducted on 384 teenagers to know their views regarding the reasons for smoking habit. A specially designed pretested questionnaire was used for the survey. Results: Majority of 76.4% of the study subjects agreed that smoking habit gives psychological pleasure, 77.5% agreed that smoking starts because of friends, and 65.7% felt that smoking starts as an inspiration for outlook and personality. Conclusion: Various psychological factors, personal factors, and social factors are attached with smoking habit. Smoking is the single most important preventable cause of death. The teenage is a critical period in the formation of the smoking habit. Globally, smoking is still on the rise among teenagers. The habit of smoking is considered a true drug addiction and is widespread all over the world. Currently, study outcomes confirm that smoking is a potential risk factor for health, causing increased morbidity and mortality that could be prevented. According to the World Health Organization (WHO), more than 4 million deaths recorded annually worldwide are related to smoking habits. Smoking is associated with a number of diseases and disorders in humans. The exposure of teenagers in any way to tobacco products can cause a variety of diseases and could influence their psychosocial development. About 4000 children start smoking each day, whereas 1500 of the adolescents aged <18 years are regular smokers. Some 545,000 youngsters become smokers annually and one-third of them are believed to die due to tobacco use. It is common that many people start smoking in young ages and become long-term addiction to nicotine. There are various determinants of tobacco use among youth. These include cultural and religious norms, availability of different types of tobacco products, tobacco control policies and strategies, and perhaps most importantly, tobacco industry behavior to promote tobacco use, and undercut tobacco control strategies. Advertising, promotion, and marketing efforts of the tobacco industry influence adolescent smoking behavior, often to a greater extent than it influences the behavior of adults. Smoking at public places in India is prohibited in public since October 2, 2008, under the Prohibition of Smoking in Public Places Rules, 2008 and Cigarettes and Other Tobacco Products (Prohibition of Advertisement and Regulation of Trade and Commerce, Production, Supply, and Distribution) Act, 2003. However, still smoking among the teenagers has not come down. There are approximately 120 million smokers in India. According to the WHO, India is home to 12% of the world's smokers. The early initiation of smoking habits and constant exposure to tobacco products increase the relative risk factor in the occurrence of serious acute or chronic health disorders. Between the age group of 14–17 years, a person is most likely to get attracted toward smoking habit and become an addict for the rest of his or her life. This is the age where the inspiration is at the maximum level, and adolescents are more conscious of their personality, styles, and making up their role models. Here in this study, the reasons of smoking have been investigated to understand why teenagers take up smoking, which would be helpful in designing the better antismoking programs. Hence, this present study aimed to highlight and also to assess the personal, social, environmental, and other factors influencing the initiation of smoking habit in teenagers of age 14–17 years in Vikarabad town. A descriptive cross-sectional epidemiological survey was conducted on 384 teenagers among teenagers of age 14–17 years in Vikarabad town of Rangareddy district of Telangana state over a period of 3 months from July 1, 2013 to September 30, 2013. List of 24 high schools and 12 intermediate colleges at Vikarabad town was obtained and using simple random lottery method, 4 high schools and 4 intermediate colleges were selected. A sample of 384 teenagers was obtained based on the prevalence of smoking among teenagers. Teenagers were included based on the inclusion criteria that is who are perceiving studies at Vikarabad town, all the teenagers both smoking and nonsmoking who were preset on the day of the survey, and the exclusion criteria were teenagers who were not willing to participate in the study. Ethical clearance was taken from the review board of the dental college. A pilot study was carried out on a sample of 30 subjects to check the feasibility of the survey and to note any difficulties encountered during the survey. This pilot study also helped to make modifications wherever necessary to design the final proforma which was based on the literature review.,,,, The proforma originally consisted of 20 items which was reduced to 15 items in the final proforma after the difficulties and the level of understanding noted among the teenagers. Validity of the final proforma was found to be Cronbach's alpha of 0.72 which is an acceptable level. The questionnaire included questions on socio-demographic factors such as age, gender, their level of education, and questions regarding the various reasons for smoking among teenagers. Voluntary willingness from the teenagers to participate in the study was considered as consent after discussing in detail about the purpose of the study. In addition, required permissions were obtained from the respective school and college principals and parents. Both smokers and nonsmokers were included as to know the views of the nonsmokers regarding what are the other possible reasons for their peer group for picking up smoking and for the smokers why they have initiated smoking. The survey is an anonymous collection of opinion with no direct question involved relating to the consumption of tobacco or count of cigarettes etc. Data were collected through the questionnaire given to the teenagers. Sufficient time was given to the students to fill the questionnaire and they were collected back on the same day. The data covering the major aspects were related to psychological issues, personal perceptions, concentration, personality impacts, and socializing activities. Data were compiled and analyzed for completeness. Statistical Package for Social Sciences (SPSS - version 20.0) (IBM Corp. Released 2011. IBM SPSS Statistics for Windows, Version 20.0. Armonk, NY: IBM Corp) was used for analysis. Mean standard deviation was used to describe the demographic details of the study population and percentages were used for descriptive statistics. Pearson Chi-square test was used to compare the opinions of commuters in receiving oral health messages based on their gender. P < 0.05 was set for statistical significance. A total of 381 teenagers participated in the survey out of which, 258 (74.21%) were males and 123 (25.74%) were females. Among these study population, 101 (26.50%) were of 9th standard, 102 (26.77%) were of 10th standard, and 178 (46.77%) were in intermediate education and 39 were smokers, remaining 341 were nonsmokers. 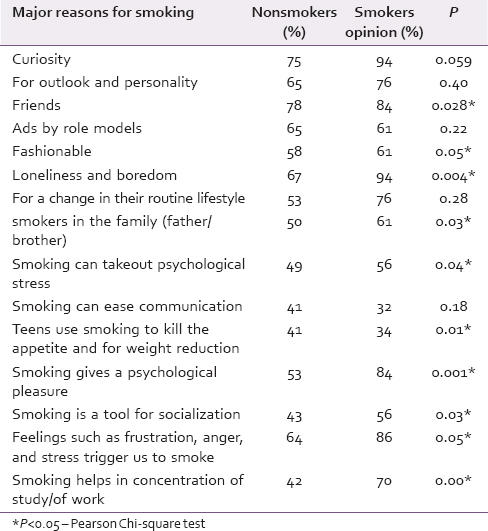 [Table 1] shows the percentages of opinions of the students about the various causes for smoking. Majority of the study participants agreed that usually smoking habit starts in youth out of their curiosity (75–94%), as an inspiration for outlook and personality (65–76%), and inspired by ads of role models (61–65%) with no significant difference observed between smokers and nonsmokers opinions (P values were 0.057, 0.40, and 0.22, respectively). Many of the teenagers among smokers (84%) agree that smoking habit starts because of friends. High percentage of smoking teenagers (61%) agree that smoking is fashionable and there was a significant difference (P = 0.05) between smokers and nonsmokers about their views on youth perception about smoking habit. Majority of teenagers among smokers (94%) agree that smoking habit starts because of their loneliness and boredom, whereas 6% of them disagree for this statement. Majority of 86% of the teenagers picked up smoking because of the mood fluctuations or various emotional feeling and a statistical significant difference as observed among the smokers and non-smokers. Following this, teenager agreed with the statement that they would like to smoke while studying which helps them to concentrate more. Socializations was another reason because of which teenagers will pick up smoking and there was a statistical difference between the smokers and nonsmokers (P<0.05). The effects of smoking on health are related to the occurrence of both acute and chronic disorders. Smoking can affect almost all the systems in the body, and in many cases, the disorders are irreversible. The teenage is a critical phase where they start adapting themselves to new life style and try to socialize in this modern era. Most of the smokers start smoking during their adolescence or early adult years. The earlier they start to smoke, the more likely they are to become regular smokers. Those concerned about the health, welfare, and education of young people should be anxious to find ways to prevent them from taking up this habit. A number of factors influence an individual to start smoking. This study aimed to highlight personal, social, and other factors influencing smoking in teenagers in Vikarabad town. In our study, we found that curiosity is one of the major reasons for the initiation of smoking. Usually, most of the teenagers starting smoking out of their curiosity to know what it is and how it is. More than 75% of the study population agree that smoking habit starts out of their curiosity. According to Rafael and Zully, the influence of the students own classmates is a great influence for the beginning of the habit of smoking. Peer influence was found to be a strong predictor of smoking initiation in almost all studies that included these measures. Our study also found that influence of friends is the major reason for initiation of smoking habit and this is similar to the studies done by Naing et al. in 2004. 14–18 years, a person is most likely to get attracted toward smoking habit and become an addict for the rest of his or her life. This age represents the growth of maturity where teens make choices for their life style and plan where they want to see themselves in the future. According to this study, majority of the teenagers (66.1%) agree that smoking habit starts as an inspiration for outlook and personality and also majority of the study group agree that smoking habit starts because of ads by role models such as movie stars and cricketers. According to the review given by Aristidis et al., commercials play an important role in the promotion of smoking behavior. The initiation of smoking is often related to the influence and immediacy of advertisements. On the other hand, this is the age where factors such as stress, attention disorder, psychological pressures, and conflicts from parents play an important role in impacting the individual personality, and most of the teens are seen fighting with these kind of problems, which may ultimately cause the initiation of the habit. Most of the study population (65.2%) agree that feelings such as frustration and anger will trigger them to smoke. The present study explored various reasons for smoking such as psychological reasons, personality impact, inspirations, weight consciousness, and killing appetite. As we have seen many cases where teens smoke for either style, causally doing the party or hang-out with friends, or sometimes it becomes an important tool for them to cope up with stress, traumas of life, or attention disorders. Hence, there are so many factors that motivate teenagers to become smokers. In most cases, the multiple factors are playing combined impacts over the subjects creating the high chances of acceptance of smoking habit. Findings of this study increase the understanding of parents, teachers, and school/college administration regarding one of the important issues of teenage, now they can help their teenagers more effectively to overcome this bad habit. School can arrange some workshop or seminar regarding the effects of smoking on physical health. Effects of smoking can also be added in the curriculum and teachers can deliver lectures on this sensitive topic, so teens can rethink about this habit. The coordinated efforts of public and private organizations, with the support of health professionals, could contribute greatly to increase the awareness of the dangers and to combating the problem. Measures are required from parents and guardians to take care of teenage problems and other matters they are dealing with. Interventions on the family level should be used to prevent the smoking habit among teenagers. Interventions programs to encourage behavior modification of teenagers are also recommended. The continuing scientific research on smoking and its effects on teenagers assists significantly in the evaluation and possible redesign and implementation of smoking prevention programs. The government should maintain a strict legal framework that could protect teenagers from smoking behavior and from the promotion of smoking advertising, at the same time, encourage the introduction of antismoking programs. The reasons why teenagers smoke was found to be multifactorial and the combined impact of all was creating high chances of smoking among them. Peer influence and curiosity about smoking were the main reasons for smoking followed by teenagers considering smoking as fashionable. The coordinated efforts of public and private organizations, with the support of health professionals, could contribute greatly to increase the awareness of the dangers and also smoking preventive programs. Naing NN, Ahmad Z, Musa R, Hamid FR, Ghazali H, Bakar MH. Factors related to smoking habits of male adolescents. Tob Induc Dis 2004;2:133-40. World Health Organization. Tobacco Free Initiative (TFI), About Youth and Tobacco; c2011. Available from: http://www.who.int/tobacco/research/youth/about/en/index.html. [Last cited on 2011 Mar 30]. Aristidis V, Zoi R, Konstantinos G. The influence of advertising messages on the smoking habits of teenagers. Pneumon 2011;24:188-93. Bewley BR, Bland JM, Harris R. Factors associated with the starting of cigarette smoking by primary school children. Br J Prev Soc Med 1974;28:37-44. Razaei M, Zully K. The Habit of Smoking Prevalence, Causes and Influences of the Environment Home-school in High School Students. 1999-2001. Argentine Federation of Cardiology. 2nd Virtual Congress of Cardiology; 1999-2001. Appau IK. Smoking habits among adolescents. Tob Induc Dis 2011;24:188-93. Pinilla J, González B, Barber P, Santana Y. Smoking in young adolescents: An approach with multilevel discrete choice models. J Epidemiol Community Health 2002;56:227-32. Rezaei F, Nedjat S, Golestan B, Majdzadeh R. Reasons for smoking among male teenagers in Tehran, Iran: Two case-control studies using snowball sampling. Int J Prev Med 2011;2:216-23. Rafael M, Zully K. The habit of smoking. Prevalence. Causes and influences of the environment home-schooling high school students. Interdiscip J Contemp Res Bus 2012;3:1-9.